I think a huge key to having a fabulous and versatile wardrobe is buying pieces that are basic, but with a twist. Instead of buying a cream cable knit sweater, buy a cream cable knit sweater with fringe detailing. 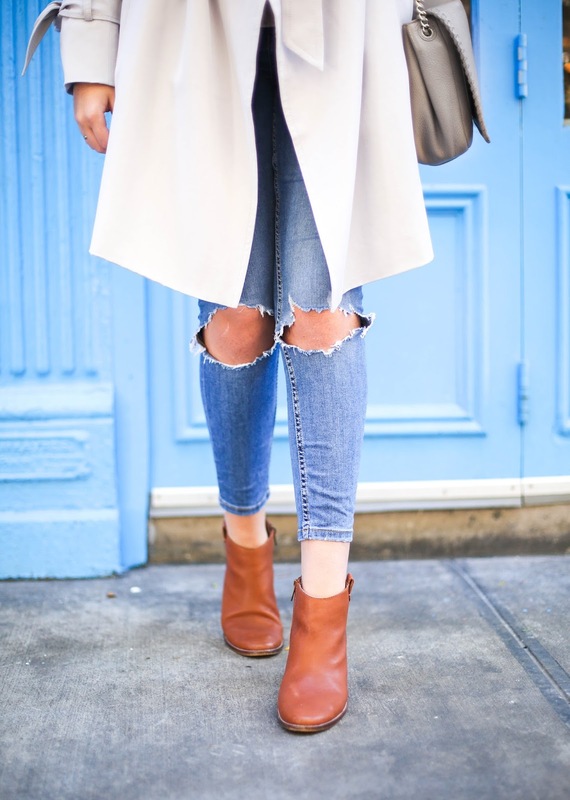 Instead of buying light wash jeans, buy light wash jeans with a raw hem and distressing in the knee. Instead of buying a navy mini skirt, buy a navy mini skirt with pom pom trimming on the hem. Think about it: doesn't a cream sweater with fringe paired with distressed light wash jeans sound so much more interesting than a plain white sweater and basic skinny jeans? Buying basics with a twist allows the pieces in your wardrobe to be adaptable to many outfits, but also eye catching. This principle is exactly what drew me to this gorgeous trench coat from Club Monaco. A trench coat is such a classic wardrobe staple. However, I would never buy just the basic tan trench coat that probably 50% of the U.S. female population has because it's simply not interesting enough to me. 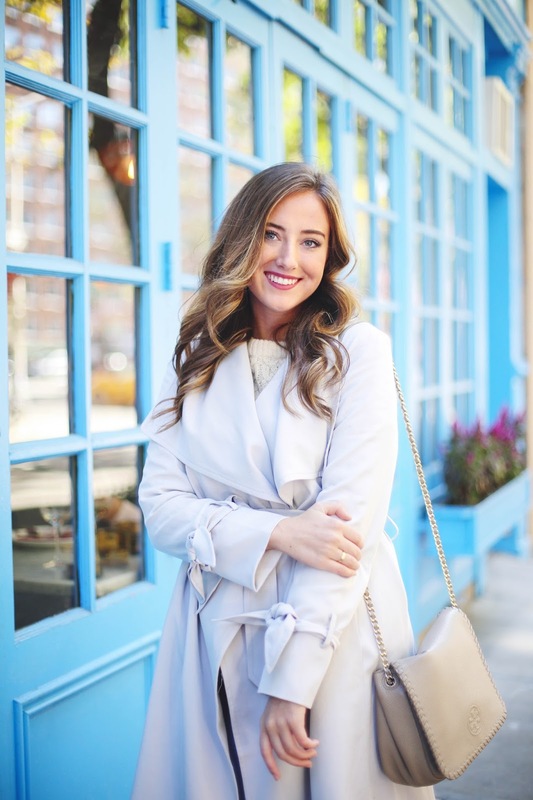 This trench is so different from the standard – the color is unique and unlike anything I've ever seen in outerwear. In addition, the ties on the sleeves add a girly and interesting touch. Even though it's still pretty hot in NYC, I wear it whenever I get the chance! I just can't get enough of it and it matches so many outfits. Kate, I love this post! That trench is gorgeous, you have amazing style!